This afternoon, I got home at the same time as I always do. I went straight up the steps to greet Tildy, like I always do. I changed out of my work clothes, into my walk-the-dog clothes, like I always do. As I was walking down the steps, I realized that I was wearing a white t-shirt and black pants for the third afternoon in a row. I probably wouldn’t have paid much attention to the fact that I was stuck in a rut except for the fact that I saw a good looking guy during our afternoon walk yesterday and I caught him checking me out as he drove toward the hospital. If he was on his way to work, I would hate to run into him again wearing the exact same thing. But by the time I had thought it through, I was already at the back door and Matilda was barking incessantly, so I threw on a different baseball hat than I wore yesterday, and kept it moving. As it turned out, I didn’t run into that guy, but it did make me think I need to step up my walk-the-dog outfits because you never know who you might meet while walking your dog down the street. This entry was posted in Uncategorized and tagged clothes, dog, outfit, walk, walk the dog clothes on June 25, 2014 by Kizzy T. Grace. 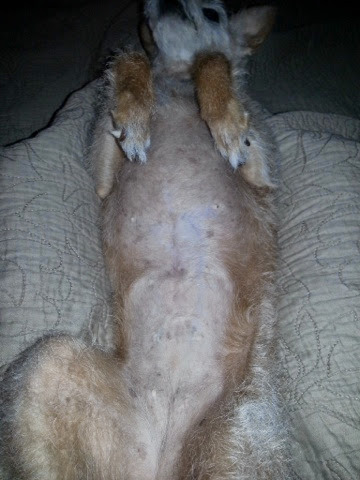 Last night during belly rub time, I noticed that Matilda’s belly has a lot more age spots on her belly than she used to. She had two large spots that I’d noticed before that were easily identifiable. But now it seems like they’ve multiplied exponentially overnight. 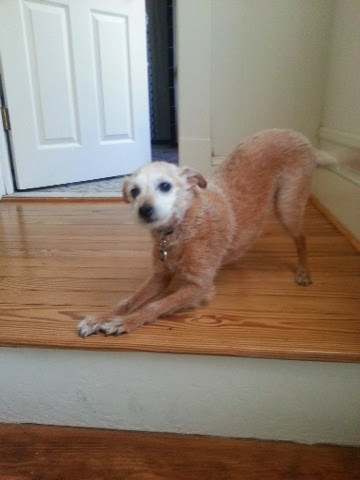 This entry was posted in Uncategorized and tagged age, age spots, belly, dog on June 24, 2014 by Kizzy T. Grace. Jinx! Buy Me Some Laundry Detergent! Yesterday, I was reading over last year’s blog posts and realized that I left y’all hanging on the incontinence saga. I chuckled to myself at the difficulties I had last year and was happy that it was all in the past. Then this happened last night. Soaked clear down to the sheet. To her credit, she did ask me to go around 3:00a.m., but it took me awhile to realize what was going on and to wake up enough to get down the steps and outside. Once we got there, she was more interested in the smells of the night than actually handling her business. It took her 15 minutes to find an acceptable spot to pee. Talk about frustrating! Then three hours later, at 6:00 this morning, she was begging to go outside again. As I was rolling out of bed for the second time of the morning, I discovered yet another wet spot. This is the first accident we’ve had in awhile. The last series of accidents occurred when a new boyfriend was spending a lot of time here. Once he was gone, she stopped having accidents. Not sure what’s causing the problem this time, but I’m thinking I might’ve jinxed myself by laughing at my prior posts on this problem. Here’s to hoping this was an isolated incident. This entry was posted in Uncategorized and tagged incontinence, laundry, sheets, wet on June 17, 2014 by Kizzy T. Grace. I just reread a lot of my previous posts and realized that I never updated y’all about the incontinence saga, so here goes. Tildy has been taking Proin twice a day for about a year and we have had no major issues (knock on wood). Matilda is about 13 years old now, so I expect her to have an accident every once in awhile. Now and then, she leaves a little dribble, but it doesn’t happen very often anymore and I couldn’t be happier. 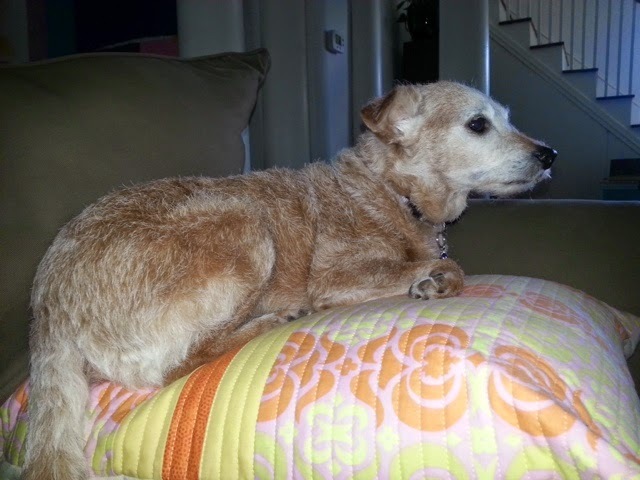 This entry was posted in Uncategorized and tagged dog, incontinence on June 14, 2014 by Kizzy T. Grace. Last week, Matilda and I encountered an unleashed Rottweiler roaming the neighborhood by himself and leaving his business all over the place. The dog lives down the street from us and I used to see his owners walk him in the evening. When I stopped seeing them, I thought that maybe they moved or something happened to the dog. Nope. They just let him out to handle his business. Since their yard isn’t fenced, he just roams freely. This irritates me to the Nth degree. First of all, this is a total disregard for the safety of the dog and those that the dog might encounter. A dog around the corner from us got hit by a car six weeks ago. He jumped the fence and ran out into the street and got hit. The driver kept going. The dog now has problems with his back legs and hips and may need surgery. This Rottweiller could’ve gotten hurt or killed. He could’ve been the cause of a serious car accident. What if the dog had come across someone and felt threatened? He could’ve bitten someone. I’ve been able to avoid the dog when I’ve seen him, but if Matilda had seen him, I would’ve had a real situation on my hands. Tildy doesn’t really like other dogs. She doesn’t care how much bigger they are, she’ll growl, show her teeth, and get ready for a brawl. And Lord help the dog that looks like he’s out to get me! The last time that happened, she bit the nose of a pit bull puppy. Secondly, it is completely disrespectful, in my opinion, to just let your dog poop wherever he feels like it and not be there to pick it up. I’ve stepped in enough piles of poop to feel quite strongly about it. I hate it when I see folks at the park letting their dogs poop in the same places where kids run barefoot. It’s just wrong. I think what irritated me the most in the moment that I spotted the dog, was that it interrupted the zen-like flow of my morning walk with Tildy. That’s normally the time of day that I take in the wonders of nature and have my private little talk with God. It’s also the time that good ideas tend to pop into my head. Seeing the dog immediately made me defensive and scared. That’s a horrible way to start the day. I’ll end my rant here. I hope we never encounter this dog again, but I’m pretty sure we will. This entry was posted in Uncategorized on June 14, 2014 by Kizzy T. Grace. 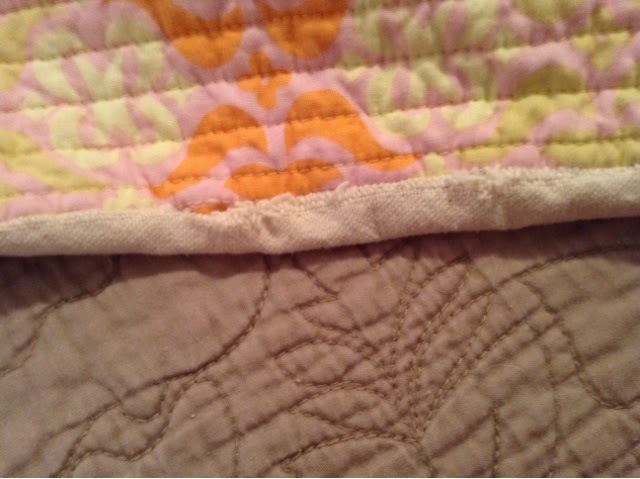 There are two things in life (outside of work) that I devote a lot of energy – making quilts and loving Tildy. 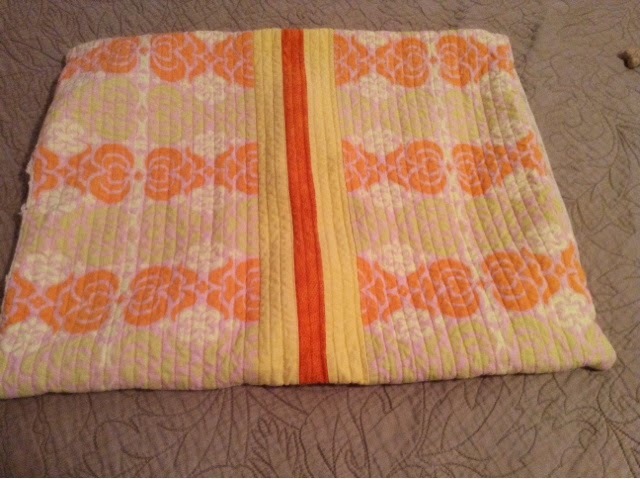 Awhile ago, I decided to combine my two passions and I made a quilted dog bed for Tildy. I love it, but she barely uses it. 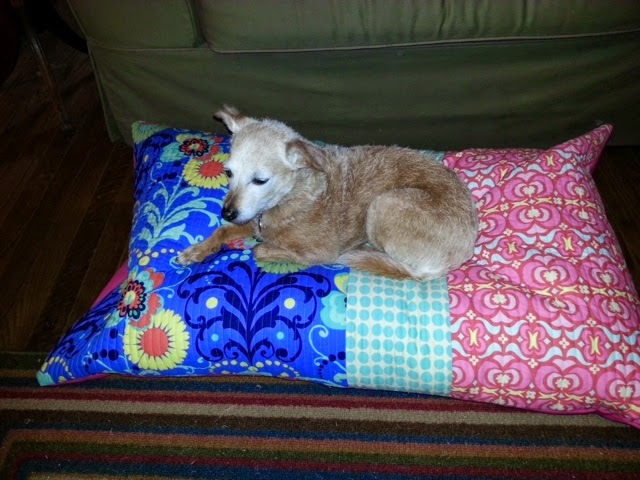 I then decided to make a pillow cover for the couch pillow she has claimed as her own. 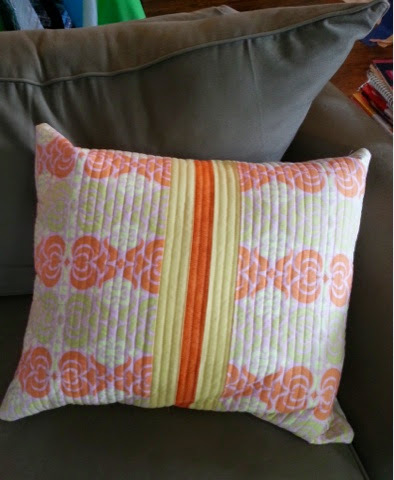 A couple of weeks ago, I threw the couch pillow cover in the washer. It didn’t hold up so well. One of the seams began to come apart. I think next time I need to use a bigger seam allowance. 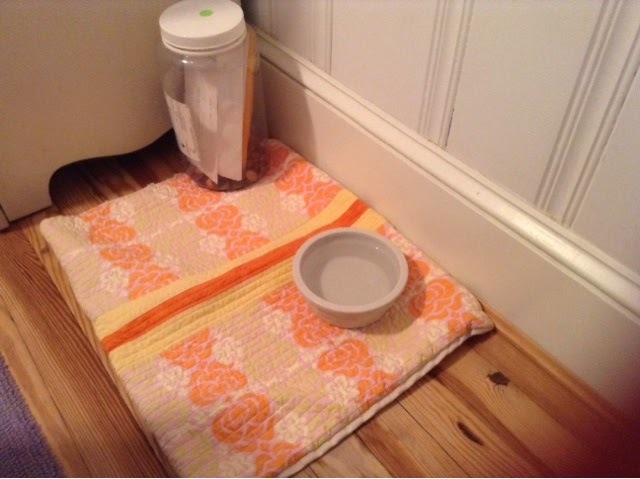 I couldn’t bare to part with it because I love this fabric so much, so it is now serving as a mat under Tildy’s water bowl in my bedroom. 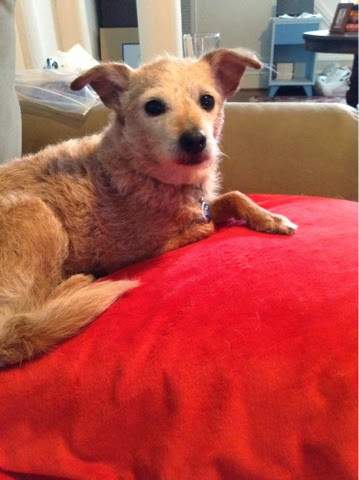 This entry was posted in Uncategorized and tagged dog, dog bed, pillow cover, pillows, quilt on June 9, 2014 by Kizzy T. Grace.